Last week, I joined over 400 people in Bogota for the 2017 Build Peace conference. It was the fourth “edition” of this annual event which has gotten bigger and better each time. Originally created to explore the intersection between peace and technology, the conference has moved beyond that to include the arts and broader questions of social change. 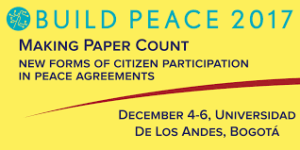 This year, we focused on “making paper count” which is an obvious issue in countries like Colombia where an agreement has been reached but there is plenty to do before peace truly takes hold. All too often, agreements don’t last. Indeed, by some counts, half of all agreements fall apart and the parties are back on the battlefield within five years of a conflict’s end. 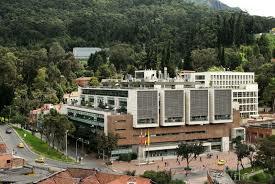 So, we gathered at the University of the Andes to explore technology, the arts, Colombia, peace, and more. As has always been the case at Build Peace, we had a mix of plenary sessions with keynotes, dialogues, and short talks with more workshops than we had ever had before. Indeed, we spent more time listening and more time working together than we ever had before at one of these events. As I expected, I spent a lot of time working with colleagues from Drexel University’s new peace and engineering program and from the Peace Tech Lab at the United States Institution of Peace. I first went to Build Peace because I knew that we peacebuilders need to incorporate everything from big data analysis to new software tools in our work. More than ever before, we explored new ways to use IT platforms and, for the first time, actually prototyped campaigns and other initiative. To my surprise, I found myself delightfully engaged in a workshop in which we developed ways indigenous Colombian artisans could export their handicrafts to the Unite d States and other Northern countries and use the profits they made to build peace in their communities. I was also amazed by the young Colombian peacebuilders we worked with. 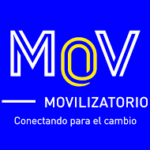 Many were part of MOV, which is an incubator that is supporting initiatives for change in all aspects of Colombian life. We heard from young people who traveled the country in a minivan to build support for the failed 2016 referendum, created youth education programs, and worked in programs that will integrate former combatants into civil society as the country tries to overcome sixty years of violence. Frankly, I didn’t know much about Colombia before I went. After just four days in the country, I realized that it is building the most remarkable peace process has world has yet seen precisely because the people who were at our conference–and many others who weren’t in the room–understand that building peace will take time and require a holistic response that addresses all of the root causes of the disputes that have roiled this fascinating country since the Spanish first arrived in the early sixteenth century. I was so taken by what I saw that I plan to feature Colombia in the textbook on conflict resolution and peacebuilding that I began while on the plane coming back from Bogota.